Phnom Penh, Cambodia, February 2009. Dy Ratha was considered privileged before the Pol Pot regime came to power. Soon after the occupation of Phnom Penh, her husband was decapitated and her mother died from an untreated illness, and her father was killed. She fled into the provinces and eked out a living to support her five young children by selling textiles. She is now an ardent political activist. 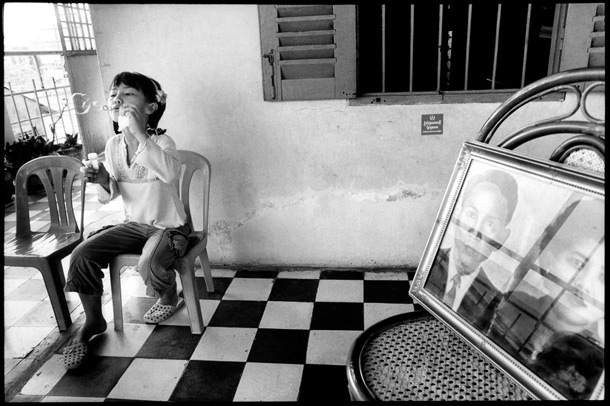 Here, one of her grand-daughters, Sobon Ratha, sits on the terrace of her home near to photographic portraits of her parents taken before the war.